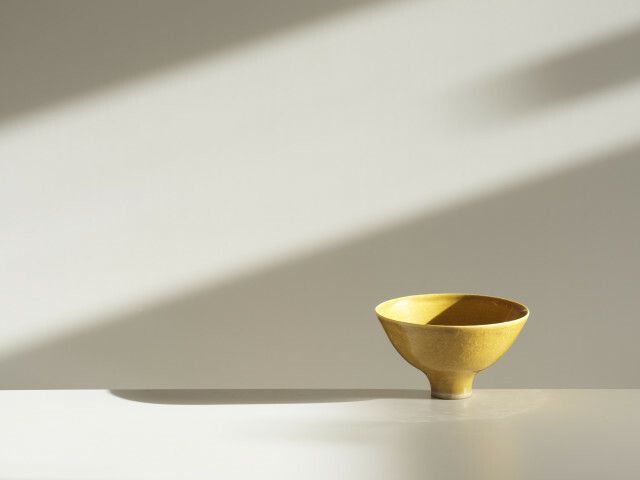 Lucie Rie (1902-1995) trained in ceramics in Vienna, but her reputation is largely defined by the period after 1938, when she settled in London and set up a studio near Marble Arch. Here she remained until the end of her life, always rising early and following a disciplined routine of throwing and raw glazing forms that expanded the vocabulary of the wheel. Her mixed clay bottles with flaring necks, sgraffito bowls and vases with heavily pitted surfaces are best judged in the context of the modern environment, of 20th century architecture and design as a whole. Rie’s true functionalism was best expressed in her tablewares of the 50s and 60s, elegant tea and coffee sets with incised decoration and iron flecked salad bowls and lidded pots. In the last two decades of her life she concentrated on more decorative individual pieces, and since her death her work has continued to climb in value.